New Zealand's leading Trotskyist group, Socialist Worker is the main supporter of Islamic radicalism in this country. In Australia that honour belongs to the Democratic Socialist Perspective and its front group, Socialist Alliance. Both organisations work closely with NZ Socialist Worker. Both are also close to the British Socialist Workers Party, which runs a pro radical Islam front, Respect, whose single MP is the appalling George Galloway-currently visiting NZ as a guest of Socialist Worker. 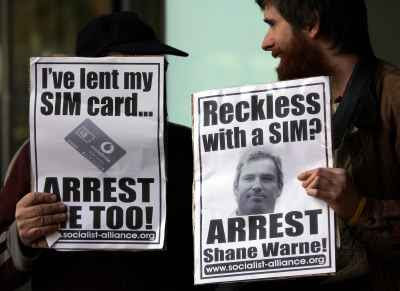 Lately, Socialist Alliance have been protesting against the detention of Indian born, Gold Coast based Dr Mohamed Haneef. While the case against Haneef has collapsed, it is interesting to note just who his supporters are. I support him. It seems there was absolutely no evidence at all to link him to terrorism and he is an innocent man having his civil liberties intruded on by the state. I thought you and your libertarian friends would be supporting him too Trev? I personally think he is guilty Cameron. That's not the issue with me though. I'm against Galloway because he works with my enemies to destroy my way of life. That's enough for me Cameron. What makes you think that about Dr Haneef? The state was unable to come up with sufficient evidence against him to justify his detention. That is good enough for me. Innocent till proven guilty, unless you live in Iran or the old Soviet Union or maybe China. Sorry Cameron-I got the wrong end of the stick. Unless there is evidence against Haneef he should be free to come and go. Just like I should be free to expose the agenda of his supporters. ... the DSP are close to the British SWP? Bloody hell, Trev, the SWP's australian affiliates in the ISO are the DSP's worst enemies on the Marxist left. Do some research, don't just repeat wishful thinking. You do some research anon. The DSP and ISO are not buddies (especially since the ISO left the Socialist Alliance. However DSP is still well plugged into SWP networks. Also NZ's Socialist Worker is far closer to the DSP than they are to their theoretical Aussie counterpart the ISO. Iran to Join Russia/China Led Alliance?